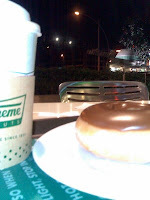 The very first Krispy Kreme donut shop in the Philippines opened in Bonifacio High Street this year. Its very first customer camped out at the shop the night before the grand opening and won a year's worth of free donuts. It's a treat for everyone with a sweet tooth. The brewed coffee is good, too.